Chapter 15: The "Pro's Pro"
His conservative understated golf slacks were pressed with a sharp crease. His wavy hair, carefully parted down the middle, never had a follicle out of place. His strong prominent chin and ramrod straight bearing projected inner strength and self- confidence. His professional career featured an array of accomplishments ranging from club-making and designing, a notable swing aid invention, service to his local PGA section, and an enviable playing record. More importantly, Elks'- Wyandot's pro Francis Marzolf was a principal member of a remarkably enduring golf family that for four generations has made major contributions to the sport. Almost from the inception of the game in America until present day, the Marzolf family has been prominently employed in various facets of the game. Edward Marzolf, Francis's father, haled from the Alsace- Lorraine region bordering France and Germany. Edward's family was prominent in winemaking. In fact, the Marzolf vineyard produces fine champagne and other vintages to this day. But Edward determined that there might be a better life available in America, and he emigrated to the U.S. through Ellis Island in the early 1900's. Edward found employment in Buffalo as the greenkeeper at the Country Club of Buffalo. The quality of the course was such that the USGA selected it to host the 1912 U.S. Open. Francis, then 8 years old, had the opportunity to study great players up close like winner Johnny McDermott, Jim Barnes, and Walter Travis. Francis was clearly destined to have a career in golf. Virtually all of the Marzolfs derived their living from the game. Two of Francis's brothers, Ray and Martin, followed their father into greenkeeping. Gene, a third brother, sold golf maintenance equipment for Toro in California. 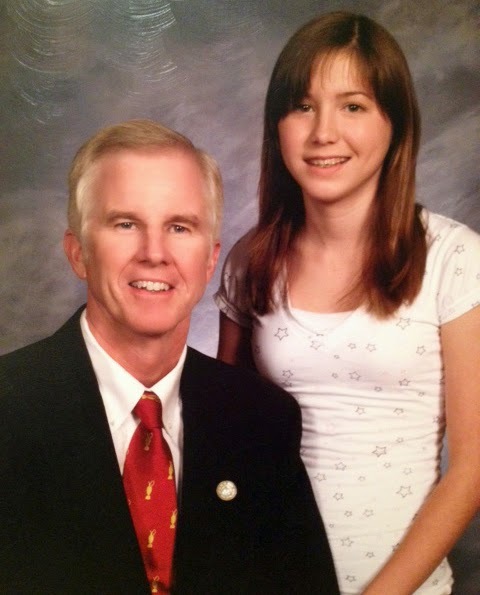 His sister, Bernadean, would marry a prominent Ohio golf professional- Charlie Lorms! 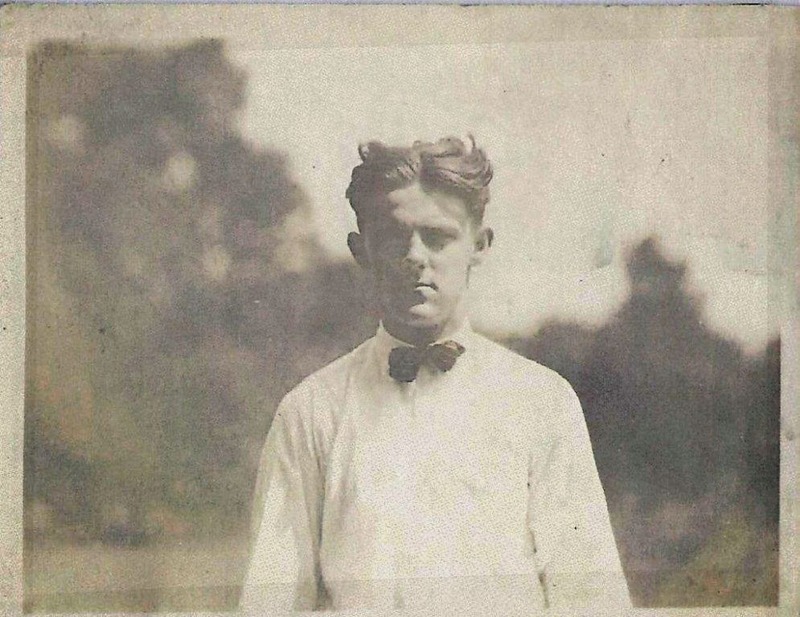 But Francis was easily the best player in the family, and in 1922, Lorms consequently hired his 19 year old brother-in-law to serve as his assistant at posh Columbus Country Club. The young man invariably showed up for work nattily attired in starched shirt and tie on even the hottest summer days. He didn't just give lessons and compute handicaps. Francis moonlighted designing and handcrafting clubs for the Burke Golf Company. Burke Golf, located in nearby Newark, Ohio, was a leading manufacturer of golf clubs during that era. Burke hickory-shafted clubs stamped with Francis's initials are among the Marzolf family's most prized possessions. Francis and Charlie became the closest of friends and confidants. 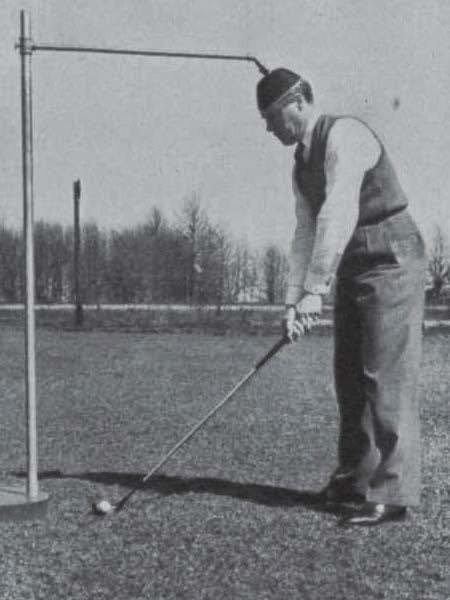 The older Lorms, with loads of club pro experience at Oakland Hills and Inverness, was an ideal mentor for the young apprentice learning his trade. Charlie and his wife also played a key role in Francis's personal life. The Lorms introduced Francis to Mary Dehner, and the young couple married in 1926. After serving four years under Charlie's tutelage at Columbus, Marzolf accepted the head professional position with Arlington Country Club. He remained at Arlington for four years, steadily building his reputation as a preeminent instructor. Though only 26, Francis Marzolf was already an accomplished seasoned pro when he left Arlington and succeeded Hermon Shute at The Elks' in 1930. While it was definitely an upward move, Francis still had to scuffle some to make ends meet. 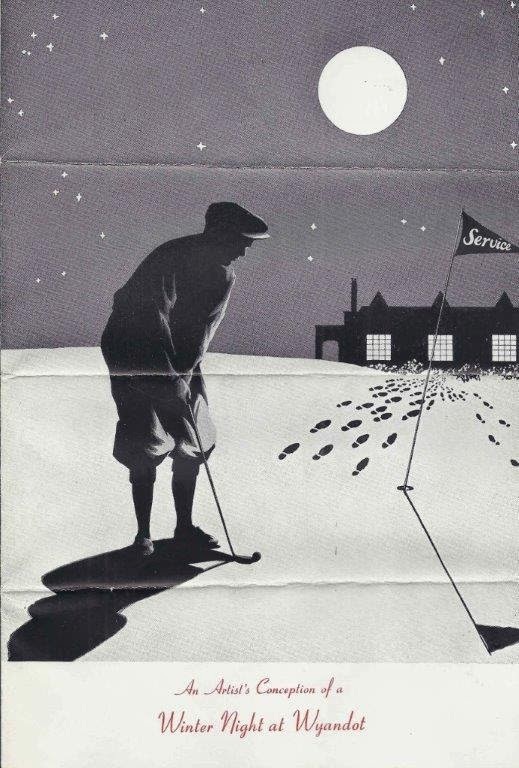 So to pick up extra money during the winter, he gave indoor golf lessons at downtown Columbus's Neil House Hotel. A club pro's job is generally a dawn-to-dusk affair with little time left over to hone the game that attracted him into the profession in the first place. Nevertheless, Francis Marzolf played some excellent competitive golf. He was most proud of qualifying along with Charlie for the 1928 U.S. Open. He qualified a second time in 1933. His rousing 64, carded at Wyandot in the late 30's, was second only to Denny Shute's 1928 course record 62. Whenever a name pro came to town to play an exhibition match, Francis was on the short list to fill out a four ball. He always gave a good account of himself in these affairs battling great players like Walter Hagen, Craig Wood and Joe Kirkwood on even terms. Later in his career, he won the Teacher's Trophy for the Southern Ohio Section of the PGA in both 1954 and 1955 earning him berths in the national PGA Seniors Championship held at Dunedin, Florida. He underscored his senior success in 1955 with a victory in the Southern Ohio Senior Championship. But it was as a golf instructor that Francis achieved greatest distinction. He stressed adherence to the fundamentals with his students: a good grip, proper alignment, and keeping a steady head position throughout the swing. Having observed that despite his best advice, many pupils were unable to prevent their heads from bobbing up and down or from side- to- side during the swing, Francis conceived of a device to stop this flaw. It became known as the "Marzolf Machine." Golfdom Magazine published a feature story describing how this rather cumbersome but effective swing aid functioned. "The device consists of a 7 ft. pipe arising from a heavy iron base. Horizontally from that pipe extends another pipe at the end of which is a leather skullcap, attached to the pipe by a roller-bearing pivot. The golfer takes his correct stance, the cap is fitted by raising or lowering the arm, and the stage is set for practice." The "machine" received rave reviews when Francis demonstrated it at Purdue University. He applied for a patent, and was prepared to market the device nationally before World War II intervened. 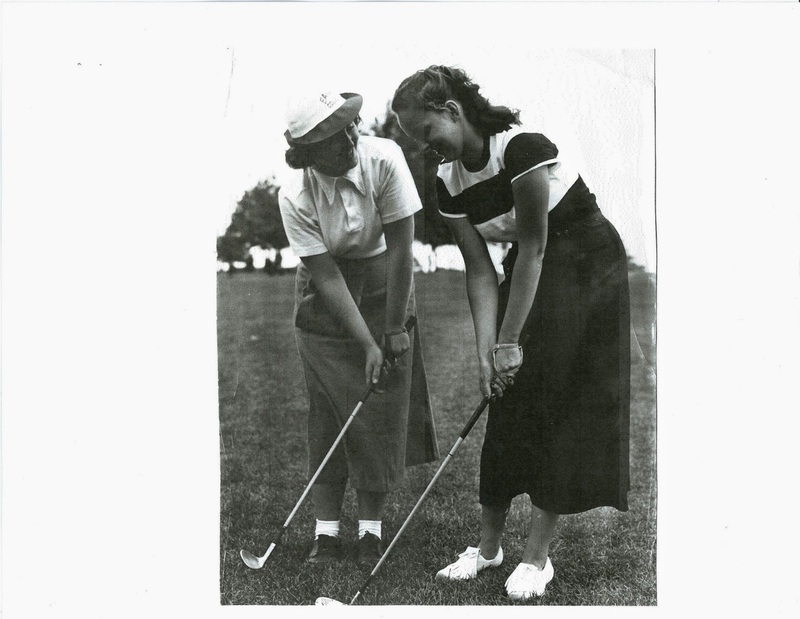 Francis's greatest achievement as a teacher was making Mrs. Thornton Emmons into a state champion golfer inside of five years after she took up the game. 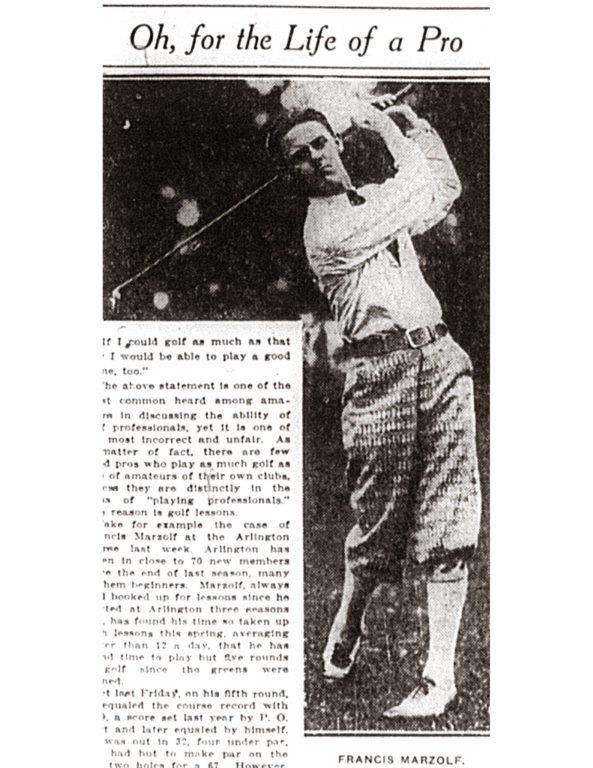 Glen Bishop, Wyandot's 1930 Ohio Amateur winner, credited Marzolf with helping him transform his occasionally erratic play into championship form. Many other prominent players, including Ohio native and future PGA champion Dow Finsterwald, benefitted from Francis's keen eye and sage advice. Joanie Terango, still a fine player at her home club of Brookside, took lessons from Francis at age 8 in the late 40's. Her memory of Francis is still fresh in her mind. "I remember Francis Marzolf as being big and handsome. My sister and I were so excited to take lessons from him because we had heard he was a really special local player. I was so lucky to have the advantage of his expertise at an early age. I guess that's one of the reasons I love the game so much." 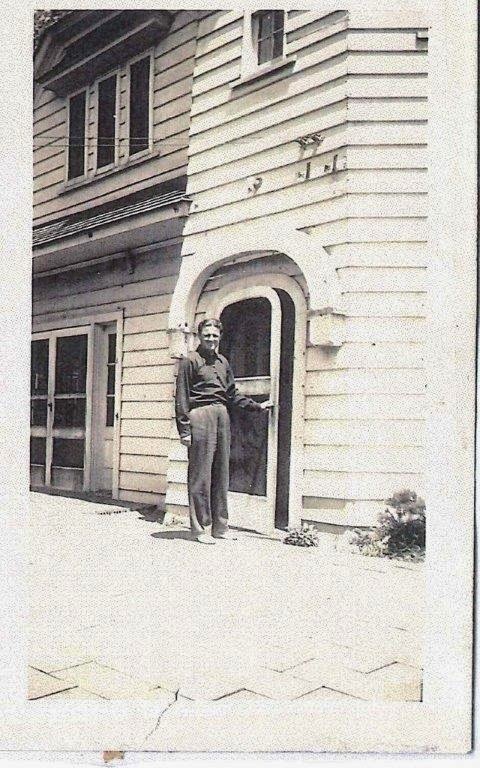 While employed at Wyandot, Francis also continued his involvement in club making as a staff member with MacGregor Golf. MacGregor manufactured a line of irons designed by Francis with the Marzolf signature emblazoned thereon. Francis's twelve years at Wyandot were happy ones. Naturally genial, he enjoyed excellent relations with the Elks'-Wyandot members. Francis was kind and helpful to everyone at Wyandot, but he was not perceived as playing favorites- a common tripwire for sociable pros. Wife Mary, helping out with sales activities in the pro shop, was likewise a whiz in the social skills department. The artistic Christmas cards she mailed annually to the Wyandot members evidence this. Francis probably never would have left Wyandot but for the war. As a result of the hostilities, he took leave from the club in 1942, and provided governmental service as a property manager for the Defense Homes Corporation. 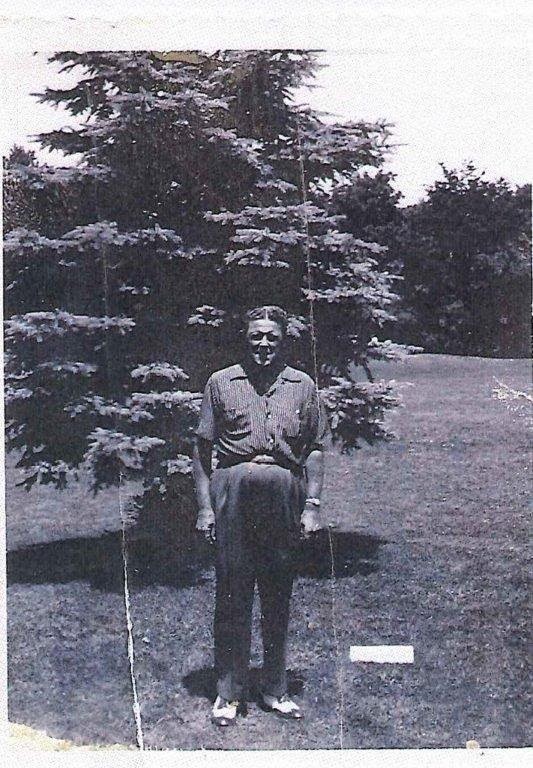 In 1945, he returned to golf by taking on the dual role of golf professional and general manager of York Temple Country Club, just north of the Wyandot Country Club. Francis was well respected by his peers and was chosen to serve in various capacities with his local PGA section, including the section's president. In 1958, Marzolf was voted the Golf Professional of the Year of the Southern Ohio Section. After 13 years at York, Marzolf was hired as the professional at Brown's Run Country Club in Middletown, Ohio where he finished his career. Shortly after retiring in 1969, Marzolf, age 65, suffered a massive fatal cerebral hemorrhage. He was stricken just after mailing a box of Mary's cookies to son Frank's family. 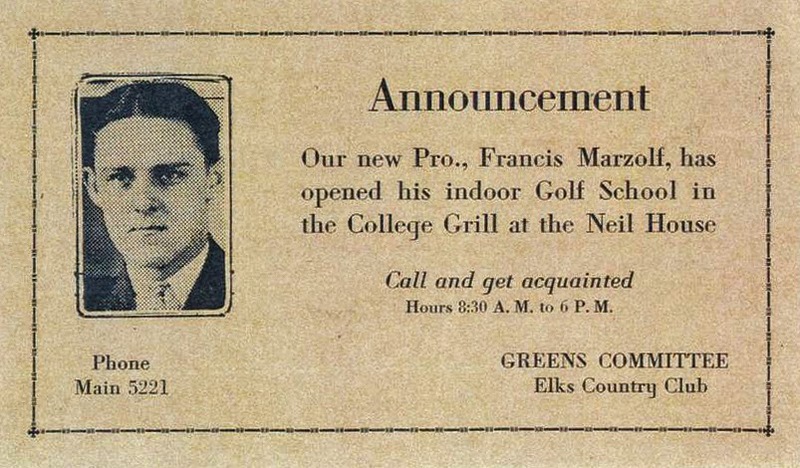 Francis was far from the last of the Marzolf family to make significant contributions to golf. His nephew Johnny Lorms, the son of Francis's sister Bernadean and Charlie Lorms, led the Ohio State Buckeyes to the NCAA championship in 1945. Johnny also took down the NCAA individual title that year. 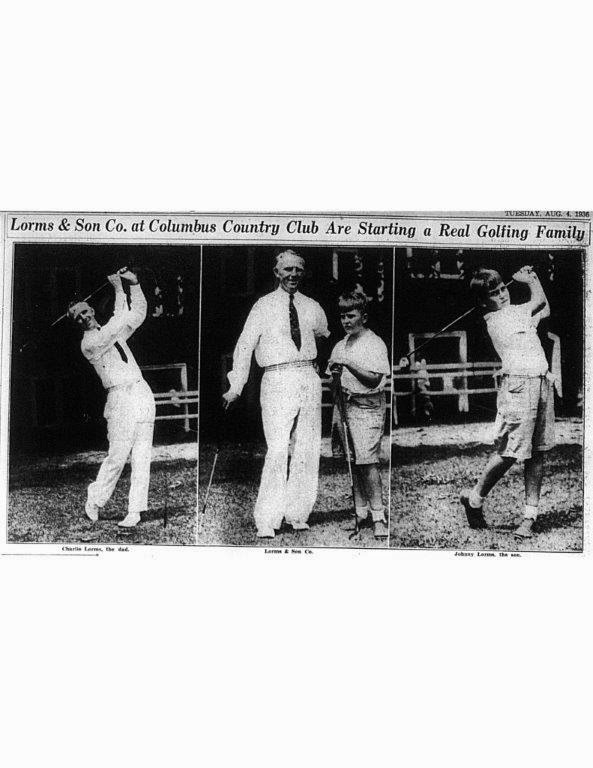 His classic swing was visible at an early age in the photos of father and son Lorms below. Frank Marzolf's son, Tom Marzolf, represents the family's fourth generation in the game. Based on his remarkable body of work with Fazio Golf Course Designers, Inc., Tom is universally regarded as one of America's finest golf course architects. He is particularly renowned for his remodeling of classic courses to get them major championship-ready. His refurbishment of Merion Golf Club in preparation for the 2013 U.S. Open was universally praised. He is currently working as the Design Consultant for Oakmont Country Club to assist with preparing that club's epic course for the 2016 U.S. Open. Tom is a Past President of the American Society of Golf Course Architects. Will there be another golfing Marzolf representing the family's fifth generation in the game? Perhaps so. Tom Marzolf reports that daughter Clara has attended the Pinehurst Golf Camp, possesses an excellent swing, and is working diligently on her game. The extended Marzolf family has been engaged in virtually every aspect of the game: golf course architecture, superintendence of courses, equipment sales, administration of the game, club management, golf club making, and golf professional. Francis's contributions to that golf legacy were profound. He inspired succeeding generations of Marzolfs to follow him into the game. To those who knew him at Elks'-Wyandot and other clubs he served, he was the best of men, respected and liked by all. In short Francis Marzolf was the consummate "pro's pro!" Acknowledgements: Tom Marzolf, Ellen Marzolf Hallerman, Bill Amick, Joanie Terango, Dow Finsterwald, archives of Columbus Citizen, and Columbus Dispatch contained in the archives of the Columbus Metropolitan Library.